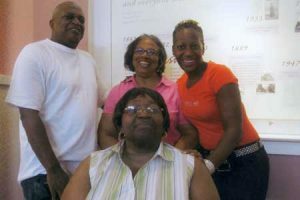 Mrs. Lois Brodie and family, hailing from Washington D.C. and Maryland were recent guests at the Biddle Hall Museum on the historic Bettis Acacdemy campus in Trenton. All are retired except Mrs. Brodie’s daughter, Lajuan, who works for Homeland Security. Mrs. Brodie remembers long ago days when horses were tied around the square and was thrilled to see that area again. While on the square, they had a chance to meet Mayor Ken Durham and even had pictures taken with him. To learn more about Biddle Hall Museum contact Mrs. Willa Lanham at 803-649-7709. The museum is open Friday from 12-4 p.m. and Saturdays 10-2 or by appointment.